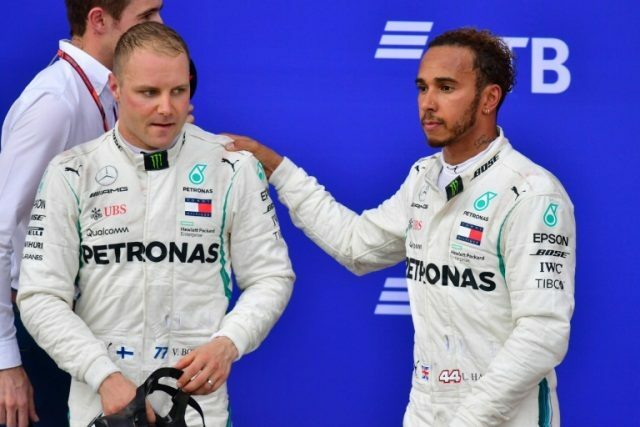 Whatever the tactical rights or wrongs of the decision to order Valtteri Bottas to allow Lewis Hamilton through to win the Russian Grand Prix, it has sparked fresh debate over team orders in Formula One. Bottas questioned the decision on team radio afterwards but Mercedes team boss Toto Wolff defended the decision as “rational” even though his “sporting heart said no”. Championship leader Hamilton said he had a “strange felling” after winning but the facts remain it gave him an eighth victory of the season. And no one expects him to return the favour until his fifth world title is firmly in the bag, leaving Bottas to keep playing the role of water carrier. Ferrari’s Sebastian Vettel admitted after last weekend’s Russian Grand Prix that he had never been the sharpest at mathematics — but at 50 points behind Hamilton with a maximum of 125 on offer in the last five races the equation is becoming simpler. Even if the German wins every race Hamilton can still win the title by finishing on the podium alongside in all the remaining grands prix. Another win for Hamilton on Sunday and even Vettel might be able to dispense with the calculator. Daniil Kvyat will be a surprise face in the paddock again after it was confirmed at last weekend’s Russian Grand Prix that he will return to Red Bull’s junior team Toro Rosso. The wheel turned full circle with the announcement — Kvyat was demoted from Red Bull to junior team Toro Rosso in 2016 after an embarrassing collision with Vettel on the Sochi circuit in Russia. He was then axed completely a year ago and replaced by Pierre Gasly after a string of poor results. But the Russian driver deserved a chance for the 2019 season, said Red Bull director Helmut Marko. For a man of such few words at the track — most of them blunt — flying Finn Kimi Raikkonen can drink and party with the best of them. And he loves to belt out a karaoke tune or two. The 2007 world champion is reported to have a share of a karaoke bar in Helsinki which has become a hot spot with Finnish celebrities.He can expect an outpouring of love from his legions of Japanese fans, many of them female, in his last Ferrari drive at Suzuka before switching to Sauber next season. And if they are lucky they might also catch him having a warble in the home of karaoke. Pierre Gasly’s revelation that debris flew under his cockpit halo and smashed into his visor at the Russian Grand Prix last weekend provided a timely reminder of the dangers of Formula One, four years after the Suzuka race that led to the death of fellow Frenchman Jules Bianchi. The Toro Rosso driver’s race ended prematurely due to suspected brake failure but not before an object that came off Daniel Ricciardo’s damaged Red Bull hit him. “It was really, really scary. I thought it was going straight in my eye,” said a shaken Gasly.